Harry Reid Attacks Americans, Drops Bombshell On Himself!!!! Home Editorials Harry Reid Attacks Americans, Drops Bombshell On Himself!!!! John Moore discusses Bundy Ranch and Harry Reid’s BOMBSHELL ATTACK upon himself: “We can’t let Americans just violate the law then walk away from it” according to him. That’s CORRECT, Harry Reid, AMERICANS WILL NOT ALLOW YOU to just violate the law by giving away America to China and ‘walk away from it’. YOU, Harry Reid, have violated the supreme law of the land, the United States Constitution, and the crime of TREASON holds the highest form of punishment, one that most Americans will agree that YOU, Harry Reid, deserve. You, Harry Reid, WILL BE HELD ACCOUNTABLE FOR YOUR CRIMES against Americans and Before It’s News readers can help hold Harry Reid accountable by PHONE BOMBING his offices at 202-224-3542, 775-686-5750, 775-882-7343 and 702-388-5020. 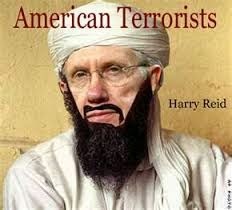 YOU are our PUBLIC SERVANT Harry Reid and you WILL BE GOING TO PRISON for your crimes against America and Americans.